Jan. 9: : North and South Korean officials meet in the border village of Panmunjom, and agree on North Korea sending athletes and delegates to the Olympics. North Korea sends hundreds of people to the games in February, including Kim’s sister, who conveys her brother’s desire for a summit with Moon. March 7: After visiting Kim in Pyongyang, South Korean presidential national security director Chung Eui-yong says Kim is willing to discuss the fate of his nuclear arsenal with the United States. March 9: Trump accepts Kim’s invitation to meet following a conversation with Moon’s envoys. March 27: Kim makes a surprise visit to Beijing for a meeting with Chinese President Xi Jinping in an apparent move to strengthen his leverage ahead of his negotiations with Trump. April 18: Trump confirms that Mike Pompeo, then the CIA chief, had met secretly with Kim in North Korea and said “a good relationship was formed” heading into the adversaries’ anticipated summit. 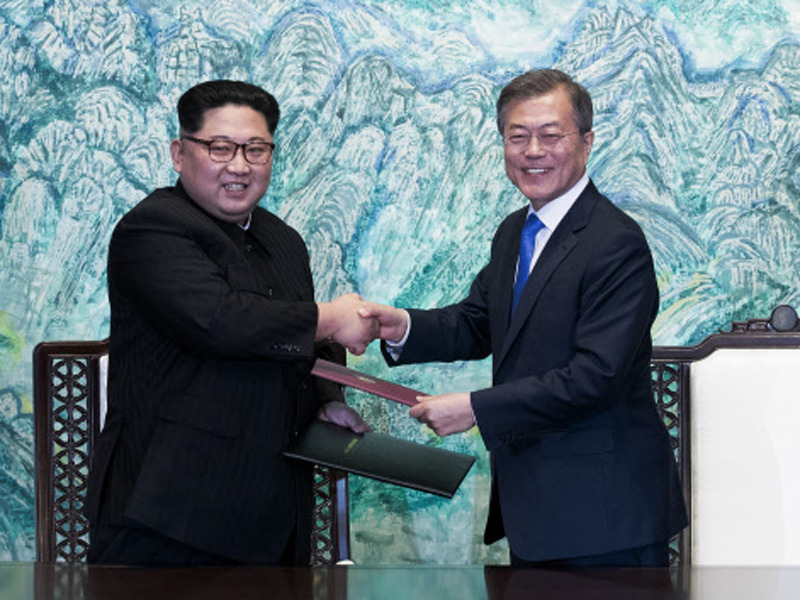 April 27: Kim holds a summit meeting with South Korean President Moon Jae-in. The leaders announce aspirational goals of a nuclear-free peninsula and permanent peace. Kim Jong Un (L), and Moon Jae-in shake hands after signing on a joint statement at the border village of Panmunjom. May 7: Kim meets Xi again in China and calls for stronger “strategic cooperation” between the traditional allies amid shifts in the region’s political environment. May 9: Pompeo, now U.S. secretary of state, makes another visit to Pyongyang to prepare for the planned Trump-Kim summit. North Korea releases three Americans who had been imprisoned, and they return with Pompeo to the United States. May 16: North Korea breaks off a high-level meeting with the South and threatens to cancel Kim’s summit with Trump in protest over U.S.-South Korean military exercises. The North says it won’t be unilaterally pressured into abandoning its nukes. May 22: Trump and Moon meet at the White House and express optimism for a successful summit between Trump and Kim. Moon says the “fate and the future of the Korean Peninsula hinge” on the meeting in Singapore. May 25: North Korea says it’s still willing to sit for talks with the United States “at any time, (in) any format.” Moon says Trump’s move to cancel the summit was “very perplexing” and calls for Washington and Pyongyang to get the talks back on track.